If you know me, you know I LOVE garlic! It is a flavorful addition to food and with it’s many health benefits I wondered if it was also good for skincare as well. Garlic has a lot of medicinal properties for skin. Its healing elements help the skin to heal and stay smooth and young. Garlic is a potent antioxidant, which helps to regenerate skin and tissues and stay young. 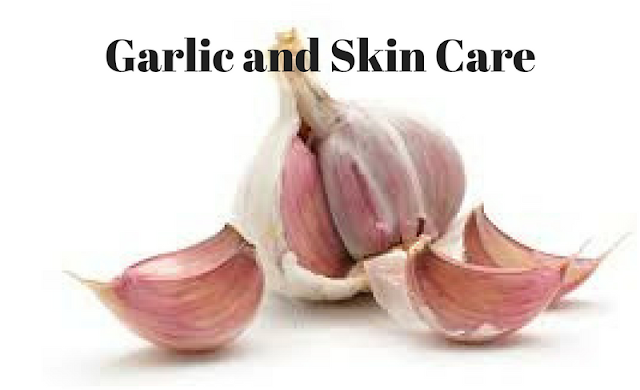 Garlic contains starch and mucilage elements that help accelerate the growth of pimples on the skin, so it is an extremely effective remedy to treat acne and pimples or bumps. It is also a powerful anti-fungal and bacterial that helps reduce inflammation, repairs tissue and fights infections and fungi. Garlic can help cure Dermatitis, Acne, cold sores, eczema, dry skin, dandruff and premature wrinkles just to name a few. Garlic also fights and prevents skin cancer and promotes circulation which helps to nourish the skin carrying vitamins, oxygen and essential elements to every cell and tissue. Besides adding garlic to your food, many people will take a crushed clove of garlic daily, along with two tablespoons of extra virgin olive oil and immediately drink a glass of warm water with lemon juice on an empty stomach. If you do this drink aloe, carrot and / or celery juice to help cell regeneration and enhance the benefits of garlic and drink at least two liters of water to maintain active toxins mobilization and proper skin moisture. Prepare a paste of garlic by crushing a clove of garlic and adding two tablespoons of extra virgin olive oil or you can use coconut oil. Apply this mixture on the damaged skin or affected part, leave on for a few minutes and rinse thoroughly. Make a paste using a crushed garlic clove, aloe gel and olive oil, remove any large pieces as garlic can be strong when applied to the skin and may cause a rash or burning sensation. Wash your face and then apply this paste on the skin for a few minutes and rinse thoroughly. Make a paste of coconut oil and garlic but strain to remove any large pieces -You want to use only the oil and garlic juice. Apply to the scalp and then put a plastic cap and leave it in your head for around 10 – 15 minutes. Prepare the garlic paste and only use the oil. Apply the garlic oil on your face, and then gently apply a clay based face mask. Spread the garlic paste directly on the bud and leave it there as long as possible, increase Vitamin C intake to accelerate results. Stress is one of the main causes of the affected skin. Remember to trust and love you, avoid negativity. If you feel a lot of worry or anxiety, make a tea of chamomile and passionflower or read things that make you feel more confident and at peace.